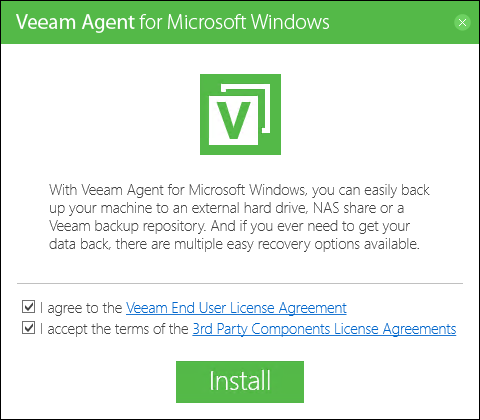 Download the Veeam Agent for Microsoft Windows setup archive from the Veeam Download page at https://www.veeam.com/downloads.html, and save the downloaded archive on the computer where you plan to install the product. Double-click the downloaded setup archive. Select the I agree to the Veeam End User License Agreement check box. Select the I accept the terms of the 3rd Party Components License Agreements check box. Auto-configure settings for the backup job. To learn more, see Auto-Configuring Scheduled Backup Job. Create a recovery image for your computer. To learn more, see Creating Veeam Recovery Media.